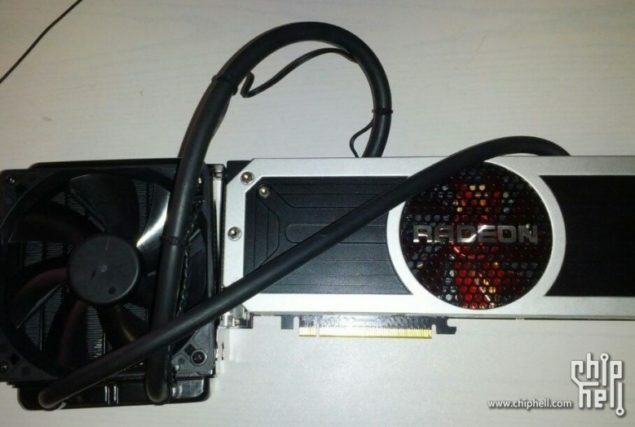 AMD’s beastly Radeon R9 295X2 has been leaked and pictured prior to its launch next week by the Chinese Chiphell Forums. 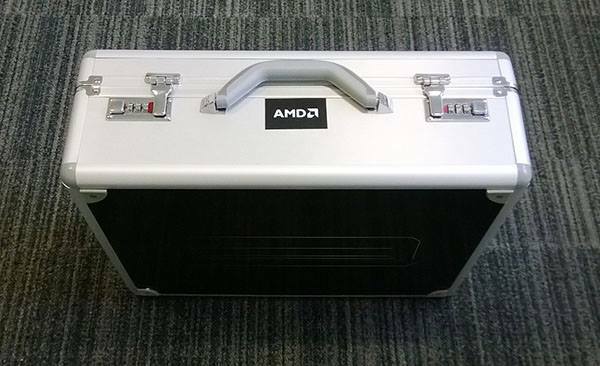 The leak has confirmed that AMD is indeed using a hybrid cooler and the design which was teased a few days back in all its glory. Images are courtesy of Chiphell Forums! AMD is going to answer NVIDIA’s dual-chip GeForce GTX Titan Z with their own dual Hawaii based card. The specifications are a complete mystery at the moment since currently, we don’t know whether the card would feature the full Hawaii XT graphics unit or the Hawaii Pro one which was featured on the Radeon R9 290 (Non-X). From what it looks like, AMD will compete with its competitor which is based on fully blown GK110 cores with their fully configuration Hawaii GPU. There’s a reason why AMD went with a hybrid cooler in the first place. AMD could have gone with a lower clocked Hawaii Pro configuration and kept a triple fan design that cooled their Radeon HD 7990. Previous reports mention a 1 GHz clock speeds on both cores so if AMD is adding up a Hybrid cooler and still fails to incorporate two of their full Hawaii XT GPUs, then that’s a disappointment. So we will take it that the card will feature the Hawaii XT chip amassing an impressive stream processor count of 5632 cores compared to 5760 core count on NVIDIA’s counterpart. The cooler will be a new step in the way companies handle GPU cooling, we have so far see several Dual Chip cards that only featured air coolers. 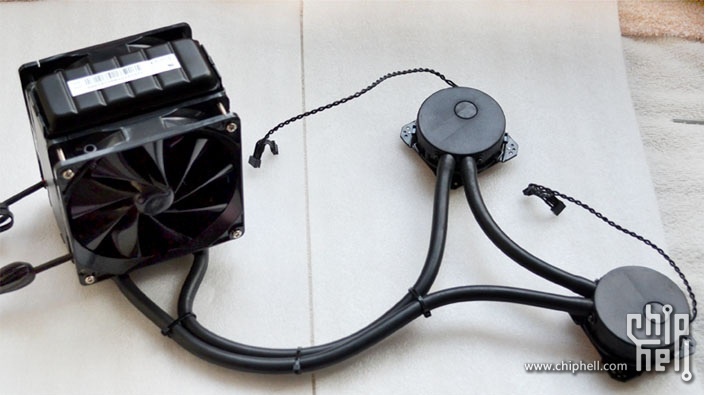 AMD was the first to incorporate Vapor chamber and now they would be the first GPU manufacturer to add water cooling as a reference design. It will be nice to see a comparison of how the card handles thermals compared to the Titan Z which features a modified NVTTM cooler with a beefy heatsink and three slot design. The card will be powered by dual 8-Pin connectors and the TDP will be around 500W at maximum. Display output include four full length Display Ports and a single DVI slot which could easily be spotted from the back of the PCB. This will help drive games at 4K Eyefinity resolutions for better and immersive experiences. From the looks of it the design we were teased was legit and the card does feature a large fan in the middle colored red, the shroud is quite simple with a black and white color theme. 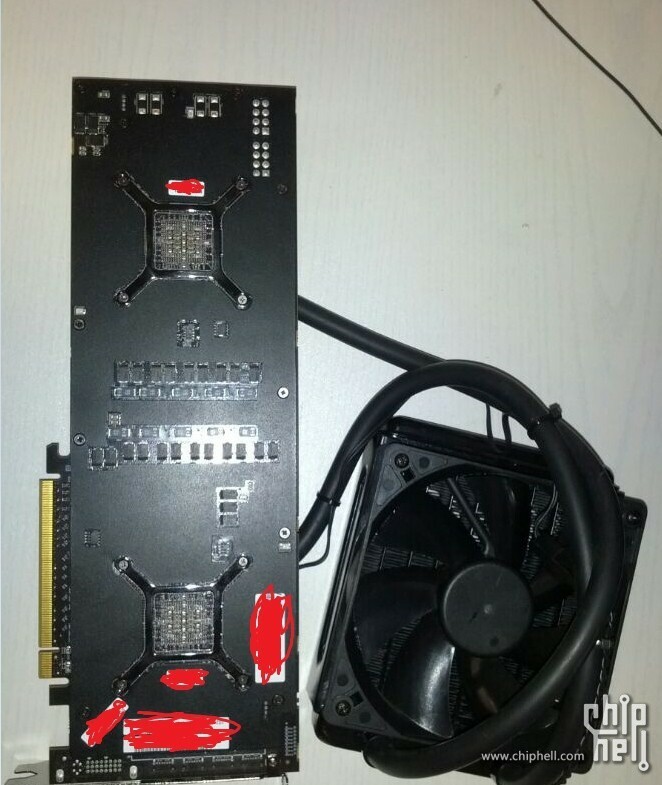 The back of the card comes with a backplate for extra cooling and does a well job hiding the ugly components at the back. 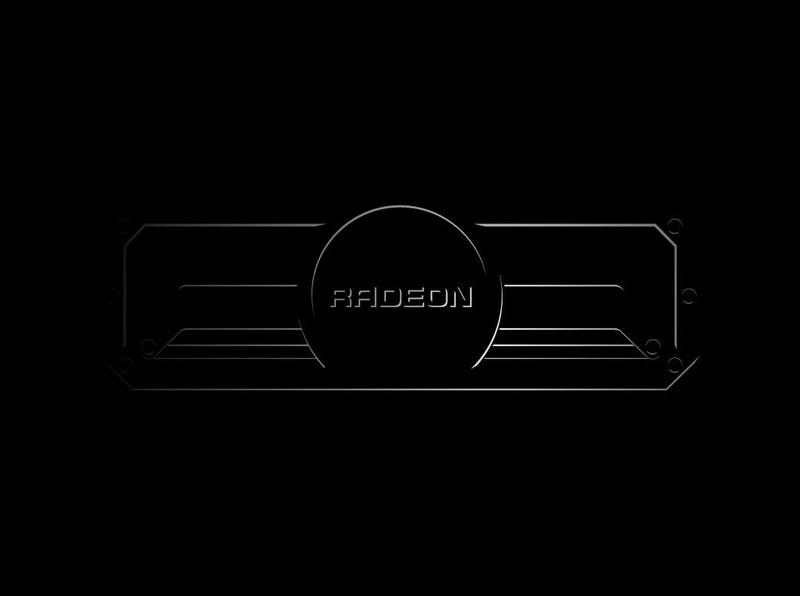 The Radeon R9 295X2 comes with a 120mm radiator which is similar to ASUS’s ARES II solution and we guess the pricing would be adjusted around $1499 US for the premium product. As for the memory, we think the card might use 8 GB of GDDR5 memory per core. That equates to 16 GB GDDR5 on the board and it should sound surprising considering AMD went with 16 GB GDDR5 on the FirePro W9100 card just a few days ago. It will also make the marketing scheme look good even if the card ends up proving just 8 GB of VRAM to end users. The card will be a great Eyefinity solution driving up multiple 4K monitors to power games and creation software. Miners could take the card as a good compute option to mine coins which in the end will drive up the cost of the graphics cards in retail outlets, we just hope it doesn’t come to that. In terms of performance, we are looking at a legendary graphics card which will feature some decent scaling thanks to the XDMA CrossFire design implemented on the new cards and hopefully some optimized drivers would be available at launch too. Note – The Chiphell user has used our chart as a source of specifications for the R9 295X2 in their forums. 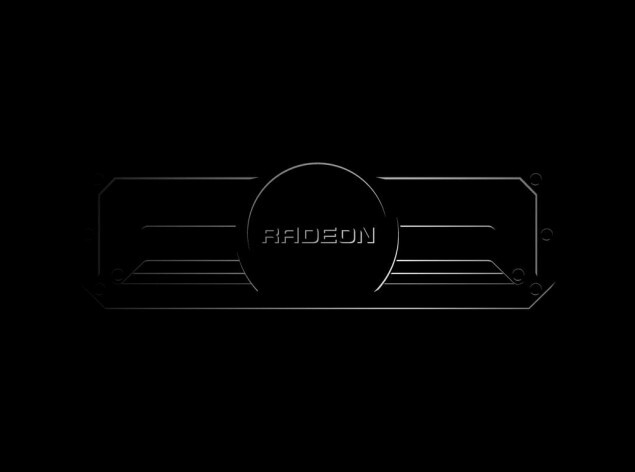 That hints that the specifications we have reported so far have been legit but in any case, AMD has something else planned, we will let you know. *Details mentioned are not indicative of the final product!